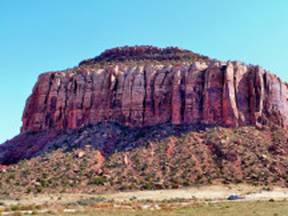 Moab is not your typical western town. The atmosphere in town tends to embrace and welcome all types of visitors, and the tolerance of others and their preferences is amazing. When you need help with your RV, help is also at hand. Quality Rv Svc & Supply repaired our furnace in short order at a fair price with a lot of ingenuity required. The self proclaimed outdoor recreation capital caters to RVers, tent campers, river-rafters, 4WD enthusiasts, off road motorcycles (trailing), horseback riders, mountain bikers, hikers, rock climbers, and “canyoneers” (the goal is to go through a narrow slot canyon touching the both sides of the canyon but not touching the bottom). 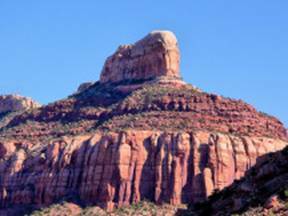 The amount of public lands around ensures a lot of options, and the terrain is challenging. The town itself has a wide variety of items available, most produced from local materials. It is a “must visit” town. The Traveling Morgans rarely have such an opinion of a town. 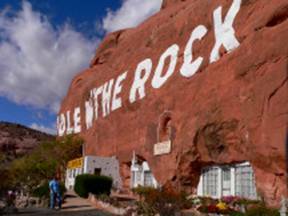 South of Moab is a home that was carved into a cliff face “Hole in the Rock”, now a tourist attraction. We did not pay to tour the inside. The outside was free. 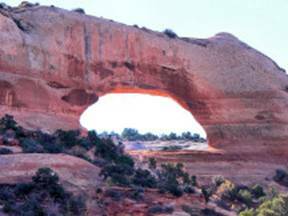 Spectacular Wilson Arch is on the highway south of Moab. 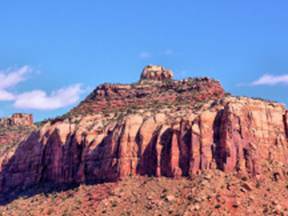 The road that leads into the Needles Unit of Canyonlands National Park has some wonders outside the park. 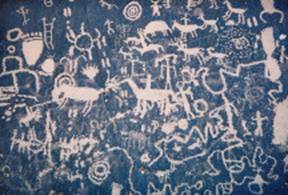 One of these is “Newspaper Rock” where prehistoric Indians (Native Americans) left messages for many hundreds of years, These are petroglyphs cut into the rock through the “desert varnish” coating on most of the rocks. 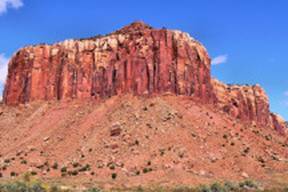 At left below is a composite broad picture of the whole of Newspaper Rock, and at right below is a close up.